Iodide is an important element required by invertebrates and many soft corals (gorgonians, sarcophytons, etc). Reef Iodide™ is a concentrated (8,000 mg/L) stabilized potassium iodide source for reef aquaria that will restore and maintain iodide levels to those found in natural sea water. It is formulated to provide a safe source of iodide that will not convert to toxic free iodine under storage or reef conditions. Iodine is as toxic as chlorine and should never be used in a reef system. However, iodide is as safe as chloride. Most iodine supplements on the market are simply potassium iodide or a medicinal disinfectant commonly known as Lugol’s Solution. Lugol’s is a highly concentrated iodine/iodide solution that is highly toxic and intended for disinfection. Although such products are sold for use in reef aquaria, we believe the risks vastly outweigh the potential minor benefits. Potassium iodide only products are a safer alternative but not very effective alone owing to the unstable nature of iodide in the aquarium environment. When added to an aquarium environment, iodide becomes unstable converting to elemental iodine (which is biocidal), iodate (which is useless to corals, toxic at elevated levels, and can't be tested for), and iodide which is the only form of iodine available to corals for uptake. These products' inherent instability makes them potentially dangerous to coral health. Unlike competing products, Reef Iodide™is complexed to a stabilizing compound in order to keep it in the iodide form when added to the aquarium. All of the product remains usable and fully bio-available. Add 5 mL (1 capful) for each 200 L (US 50 gallons) every other day. Add 1 mL for each 80 L (20 US gallons) daily to raise iodide by 0.10 mg/L. If necessary, adjust amount so that iodide reads 0.06–0.08 mg/L 6–12 hours after the last amount. Thereafter, use this amount daily and check iodide twice a month. After determining the iodide consumption rate, set up a continuous drip system. Use the following formula (or skip the math and use our Dosage Calculator) to determine how much to add to your top-off water: m=0.125vi (m=mL of product to add to top off water, v=volume of tank in liters, i=amount to raise iodide in mg/L). For example, if you want to raise iodide by 0.10 mg/L in a 200 liter tank, then you would add 0.125x200x0.10=2.5 mL into the top-off water. [For reference: 1 gallon=3.8 L]. It is normal for iodide levels to decline after a few days. This results from utilization and chemical depletion. Therefore, amount and/or frequency of use can be varied. Amount used can be adjusted based on coral response. 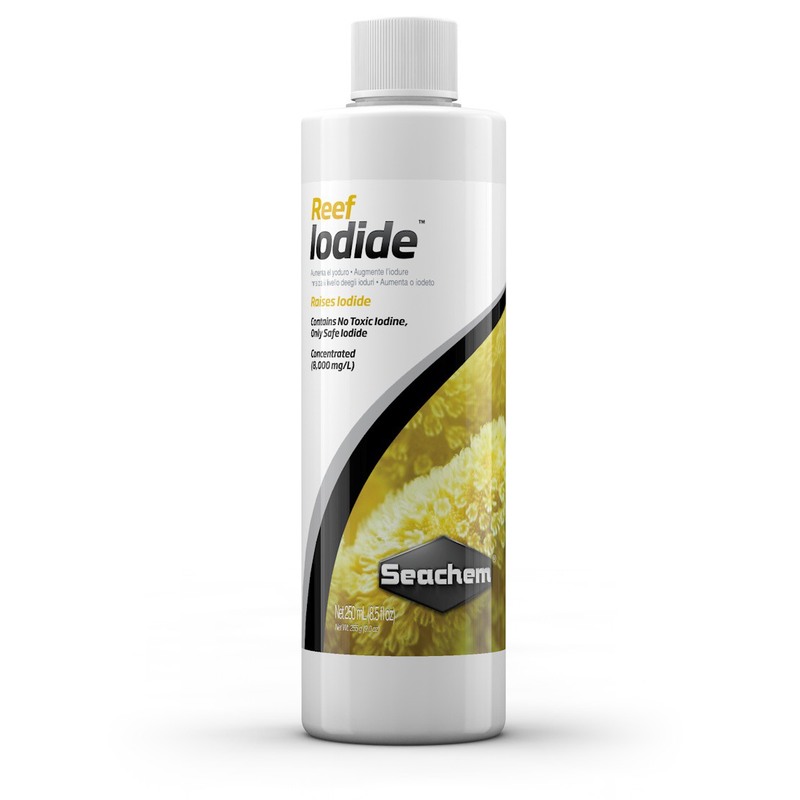 To check iodide levels use Seachem’s MultiTest™ Iodine & Iodide test kit. Use MultiTest™ Iodine & Iodide to test idoide levels. If necessary, adjust amount so that iodide reads 0.06–0.08 mg/L 6–12 hours after the last dose. Natural seawater has an iodine concentration of .06 mg/L; however, many corals and crustaceans can benefit from a slightly higher concentration. It is normal for iodide levels to decline after a few days. This results from utilization and chemical depletion. Therefore, frequency of use will vary with different reef tanks. How is Reef Iodide™ different from Lugol's solution? I have heard very bad things about Lugol's. A: Reef Iodide uses potassium iodide. It is not Lugol's or a Lugol's like solution. Lugol’s Solution is a medicinal disinfectant. It is a highly concentrated iodine/iodide solution that is highly toxic and intended for disinfection. Although such products are sold for use in reef aquaria, we believe the risks vastly outweigh the potential minor benefits. Potassium iodide only products are a safer alternative but not very effective alone owing to the unstable nature of iodide in the aquarium environment. When added to an aquarium environment, iodide becomes unstable converting to elemental iodine (which is biocidal), iodate (which is useless to corals, toxic at elevated levels, and can't be tested for), and iodide which is the only form of iodine available to corals for uptake. These products' inherent instability makes them potentially dangerous to coral health. Unlike competing products, Reef Iodide™is complexed to a stabilizing compound in order to keep it in the iodide form when added to the aquarium. All of the product remains usable and fully bio-available.